Social media has already transformed society. Now it is poised to revolutionize communications and collaborative business processes. 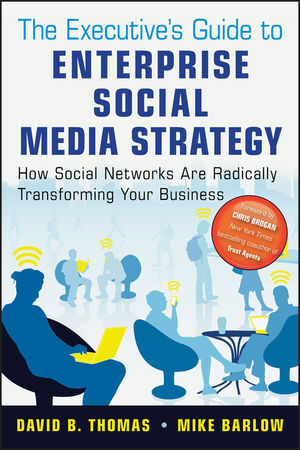 This book provides you with an actionable framework for developing and executing successful enterprise social networking strategies. Using straightforward language, accompanied by exhibits and fleshed out with real-world stories and revealing anecdotes, you will learn how to develop your own internal corporate social media strategy. Through the use of in-depth interviews with leading companies using these strategies, you will also discover best practices that will propel your business to new heights. DAVID B. THOMAS is Executive Director at New Marketing Labs, a new media marketing agency. Before joining NML, he was social media manager at SAS, where he led the company's global social media strategy. A marketer and communicator with more than twenty years' experience, Dave blogs at dbthomas.com. MIKE BARLOW is an award-winning journalist and author. He is Managing Partner at Cumulus Partners (cumuluspartners.com), a marketing communications strategy consulting firm specializing in original content development and content-based marketing. Country Village or Gleaming City? So, What's the Best Way to Skin a Mastodon? Questions You Should Be Prepared to Answer. Part I: The Grand Scheme of Things. Chapter 1: Speed, Scope, Complexity, Power, and Potential. A World of New Challenges and Opportunities. Getting a Firm Grasp on a Viral Phenomenon. Step Up and Meet the Millennial Generation. Just What You Needed: Another ?Perfect Storm?. Chapter 2: The New Mode of Production. Social Media, Teamwork, and Collaboration. Mapping Social Media to Results. Driving Knowledge into and across the Organization. Chapter 3: The Social Enterprise. Collaboration is the New Efficiency. The Train Is Leaving the Station? High Speeds Need Seat Belts. Take the Time to Write It Down. Part II: Building a Structure for Success. Chapter 4: Get Everybody Together in the Same Room. Invite the Practitioners, Not Just the Rulemakers. What Are Your Existing Goals? What Makes Sense in Your Industry? What Makes Sense in Your Company? How Can You Figure Out What Will Work for You? Chapter 5: Creating Social Media Guidelines. Guiding Principles for Social Media at SAS. Include Do's as Well as Don?ts. Communicate as Often as Possible, in Every Channel you Have. Chapter 6: Staffing and Structuring. How Do You Structure for Social? How One Organization Pulls It Together. Chapter 7: Listening, Measurement, Analytics, and ROI. First, a Word from the Measurement Queen. ?Listen Yes. But Think Bigger.?. Not a Simple Formula, but a Formula Nonetheless. Chapter 8: The Keys to Success in Social Media. It's Difficult in Its Simplicity. Nine Easy Ways to Write a Blog Post. Part III: Putting Your Social Media Strategy to Work. From the Nursery to the Kitchen. Chapter 10: Social Media for B2B. Taking an Integrated Approach at Cisco. The Old Model of PR. The New Model of PR. Social Media PR at the Mayo Clinic. Turning Twitter Connections into Sales Leads. Chapter 13: The Voice of the Customer. Nothing Is Certain but Twitter and Taxes. Social Media and Internal Communications at SAS. Appendix: Intuit Social Communications Policy.